Description: A detail from the 1719 Moll World Map showing the Florida peninsula, coastline, major rivers including the St. Whan's River (St. Johns River) and St. Pedro River, and settlements including St. Augustine. This map shows the claimed territories of France outlined in blue, including lands west of the present day Wacissa River, and Spain in red, which includes peninsular Florida north to the limit granted by King Charles II to the proprietors of Carolina in 1663. 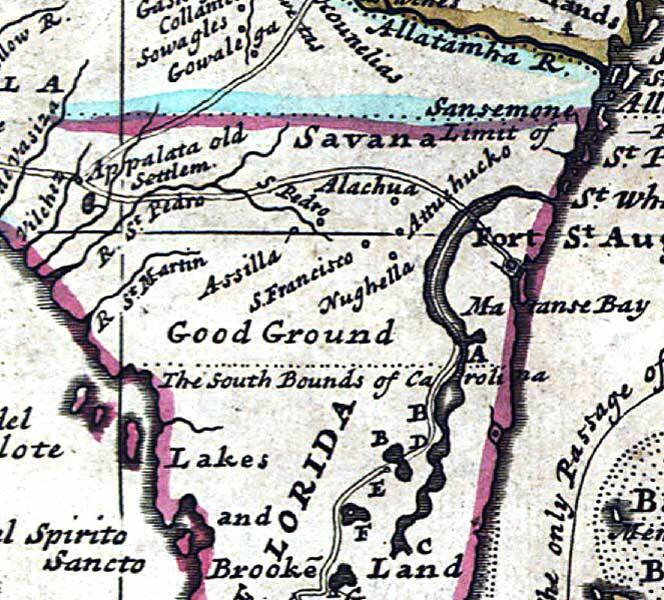 There is a boundary shown in central Florida indicating the south bounds of Carolina, and a reference to "Good Ground" in the central peninsula. The route between Fort St. Augustin on Matanse Bay (Matanzas Bay) west to the old Spanish settlement of Appalata (Apaalachia), and the partial route of a slave-hunting expedition from the St. Whan's River (St. Johns) to the interior described as: "Explanation of an Expedition in Florida neck, by Thirty-three Iamesee Indians Accompany�d bt Capt. T. Nairn. A. The place where the Indians leave their Canoes to go a Slave-Hunting, it is 6 days Rowing from St. Whan�s Rivers Mouth. B. Large inland Lakes, some of them joined together. C. The Furthermost place where ye Indians have gone with Canoes. D. Place where they left their Canoes. E. The Path they took to go a Slave Catching. F. Cacema Town. G. Large Pond where was one house. H. Place where they Swam over a Deep River. I. The same River is here Brackish. K. Place where they took 29 Slaves. L. Here they took 6 Slaves. M. Here they took and Killed 33 Men at 2 a Clock ye same day a very Numerous body of Indians came against them, they being but 33 Men, yet put them presently to Flight; they having no Armes but Harpoos, made of Iron and Fish bones; they were all Painted. N. Fresh water Creek."